They’ve gone from EPWPs working along the beachfront from Sunrise Circle to St. James to employees of the Muizenberg Improvement District (MID). During their first month with MID, they filled almost 2,000 bags with sand, weed and litter cleared from gutters, sidewalks and public garden spaces. You may have seen them pushing a wheelbarrow, carrying a spade or filling a bag with sand. This is the new MID Cleaning Team made up of Michaela, Kenneth, Romano and Shaakirah. 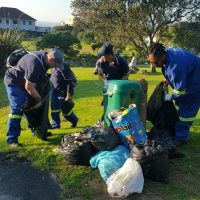 The team is a combination of former EPWPs who were placed within City Solid Waste or Parks and Recreation departments working in the Muizenberg area and social development referrals. Linking the MID mandate with the City’s Social Development strategy of providing economic opportunity with emphasis on professional and personal development and skills upliftment. The transition from EPWP or social development client has not been an easy one. Cleaning the MID streets means that you are constantly in the public eye and it is physical work, in all types of weather and in an environment that can at times be overwhelming and harsh. Hard work, a supportive management structure and great team camaraderie has ensured that the team recognise the value in each other and the important role that they play in the Muizenberg experience. July has seen some exceptional highs with one resident commenting. “Thank you so much for the huge improvement in Amberley Road this morning. Shakira, Michaela, Romano and Kenneth made a huge difference this morning. We are absolutely delighted. The stairs that lead from the station up the mountain were so overgrown, the team even found a snake!” – Amberley Road resident. August however was off to a steep learning curve when the team, with the best intentions, “trimmed” a plant overhanging onto the sidewalk in Palmer Road. Unfortunately the plant did not survive the trimming and the team bore the wrath of the plant’s owner. MID will ensure that the plant is replaced and while the interaction was not a pleasant one, they have learnt and grown from the experience. i.e. The Muizenberg Improvement District offers top-up street cleaning services Monday to Friday and does not replace the City of Cape Town services, but compliments it. We value our City partners and appreciate the commitment, reliability and hard work of those who clean the streets, restoring a sense of pride in the communities in which we live, work and play.